I was driving home from church in June, east on Sheridan Drive between Youngs and the fire station. A little way up, on the other side of the road, traffic was stopped, so I slowed down. I couldn't see what the problem was at first, but since I was the first car in my lane, I could see that about 60 geese were crossing the road! Adults and babies of all sizes were sauntering across, in more or less straight lines, following each other but with gaps of changing length between the groups. Just when it seemed a car might squeeze through, another gaggle of geese started across. Four lanes of traffic were completely stopped and although I was anxious to get home, I was smiling to myself about the cuteness of the sight in front of me. I had one of my 10 year old daughters with me, in the backseat, and she, too, was enjoying the geese. Suddenly, a big, black SUV pulled up in the center lane facing West. Two men, a young man maybe in his late 20s, and an older man, got out of the car and the younger man released his large brown dog from the backseat. 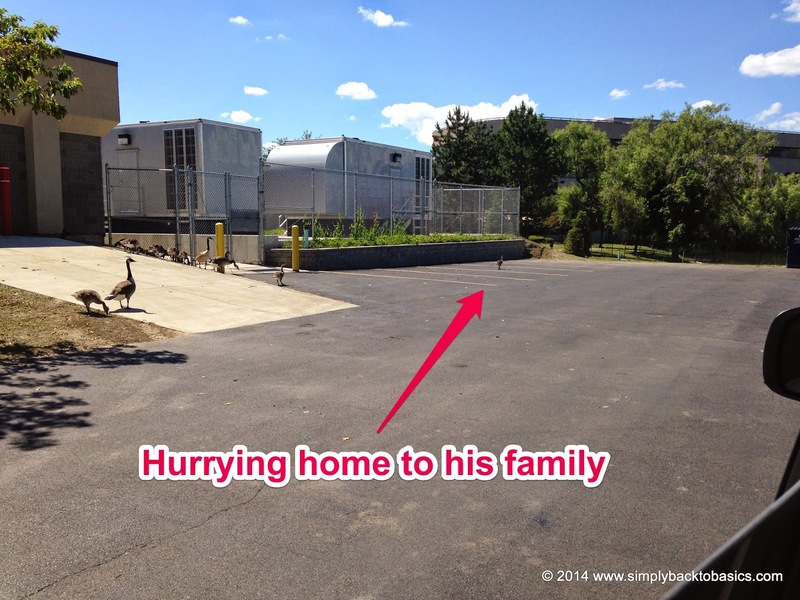 His dog raced at the geese and chased them all out of the street. Chaos reigned as geese began running for their lives. I watched in horror, as this giant dog, teeth bared, overtook the geese as they got onto the sidewalk and killed a goose, five feet from my daughter's window. Of course, as soon as this happened, two things occurred simultaneously. One, the traffic started moving because the geese were no longer blocking the road, and two, the terrified geese began to return to the other side of the street, to escape. This created more horrible chaos and I watched helplessly as geese of all ages honked and cried to protect themselves and their babies. By this time, the man had caught his dog and I was quite close to him. I pulled forward and yelled to him "Why did you do that? You could have waited like everyone else. They were doing just fine on their own. That was the cruelest thing I have ever seen!" He laughed at me and said "The goose is fine." I said "The goose is NOT fine, it's DEAD and your dog KILLED IT and I have my child in the car. He killed it right in front of her!" by that time I had to move on, as the traffic was clearing. I was so shaken up and my daughter kept asking me "What happened"? and "Why did he do that?" I had no answer but that he was an arrogant man who wanted to prove himself to the world that he could take care of the problem. I was very close to home and found my husband and collapsed into tears of grief for the geese. I hadn't realized until that moment what I needed, but what I needed was to go back, to see what had happened to the geese. He and my 19 year old son took me back and we found the dead goose, which we then realized was a baby. My husband and son gently picked him up in a box and took him back across the street and left him in the woods, while I mourned the innocence and fragility of life. We slowly drove down Sheridan wondering if any had been hit by cars as they were crossing. Just at our street, we saw a solitary baby goose wandering alone, pecking at the grass. We realized that he had become separated from his flock and was unable to cross busy Sheridan Drive by himself. We knew we had to help him. My husband and son managed to catch him in a towel and we brought him into the van. My son held him on his lap and soothed him. We drove behind Wegmans and the AAA looking for his flock. We finally found them, far from the original crossing site, on a lake in the corporate park. 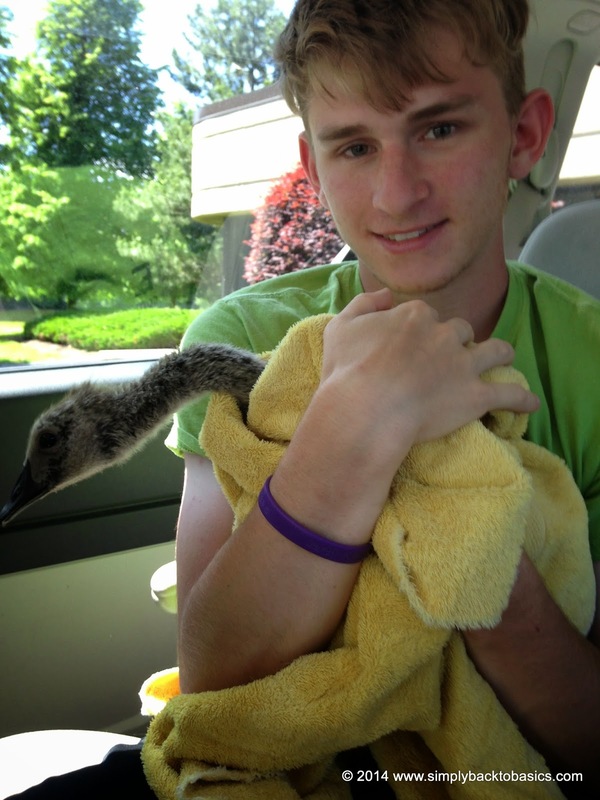 We released him to his family, where about 30 baby geese were roosting with their parents. He quickly waddled off to rejoin them, welcomed back by the others. I don't know who that young man was, but I hope he reads this or someone recognizes him and shares it. I hope he allows himself to acknowledge and regret his impulsive and careless decision to release his dog to "solve" the problem. Life is fragile and special in all of the earth's creatures and to hunt something down in cold blood is neither admirable nor brave. Everything we do has an impact on others and the world is a series of interconnected emotions and experiences. As my daughters learn in school, he should "Stop, Think, Go." I am grateful that each of my four children demonstrates empathy, compassion and patience; that they know that the response to bullying and violence is to stand by and protect the victim. I am grateful that my husband is a strong, sensitive, loving man who supports me unconditionally and doesn't hesitate to help when I say I want to rescue a baby goose. He just grabs the keys and joins me. Oh, Linda, This piece is so moving. You demonstrate clearly how the best antidote to cruelty is compassion and kindness. I am happy for you that your family understands this, too. Thank you so much for rescuing that baby! Ask Linda: Any Ideas for Garage Organization?